This reminded me that I did do a sample OIII image the other night. It is the same camera settings (Unity, 5 min. sub) and same focus as the Ha. One thing that throws off the comparison is my Ha filter is the 5nm bandpass and the OIII is 3nm. Anyways, the pattern is clearly visible in the Ha, and not visible in the OIII, but I figure that just comes down to the 3nm OIII not letting in as much light as the 5nm Ha. So, not conclusive, but still interesting. The pattern is definitely present in this image. 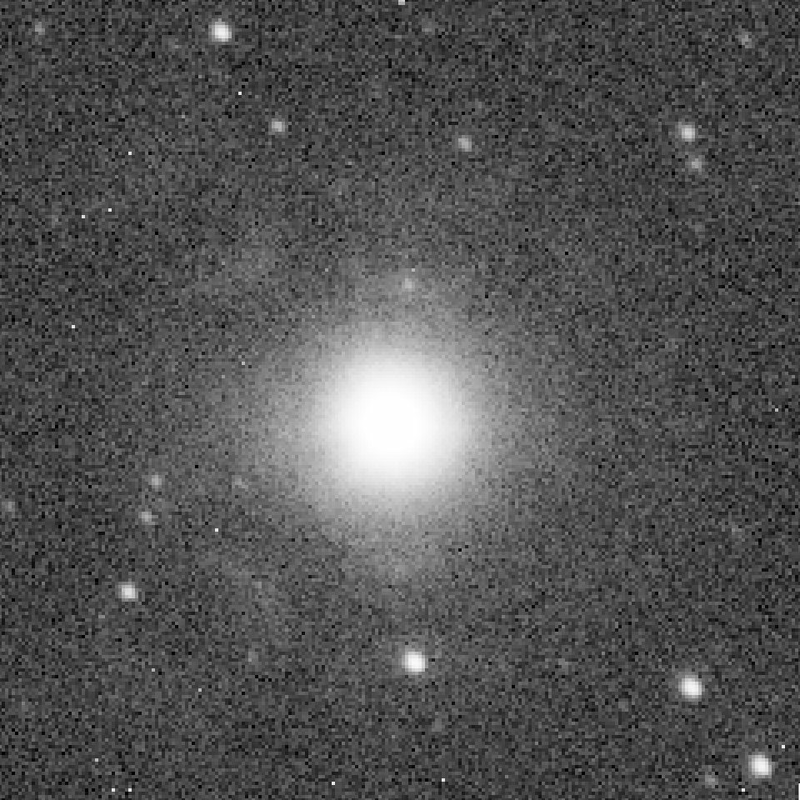 It is faint, but you can see arcs reflecting off neighboring microlenses for this big star. There are four primary ones, all at 90 degree angles rotated by 45 degrees (so, starting at 45, then 135, then 225, then 315). I would attribute the difference between the intensity of the pattern in your image to the difference in aperture (in terms of area, your scope has 3.5x LESS aperture area than mine, on top of the difference in f/ratio). The star really does have to be BRIGHT. In my case, they are always heavily clipped, because they saturate in mere seconds even with NB. 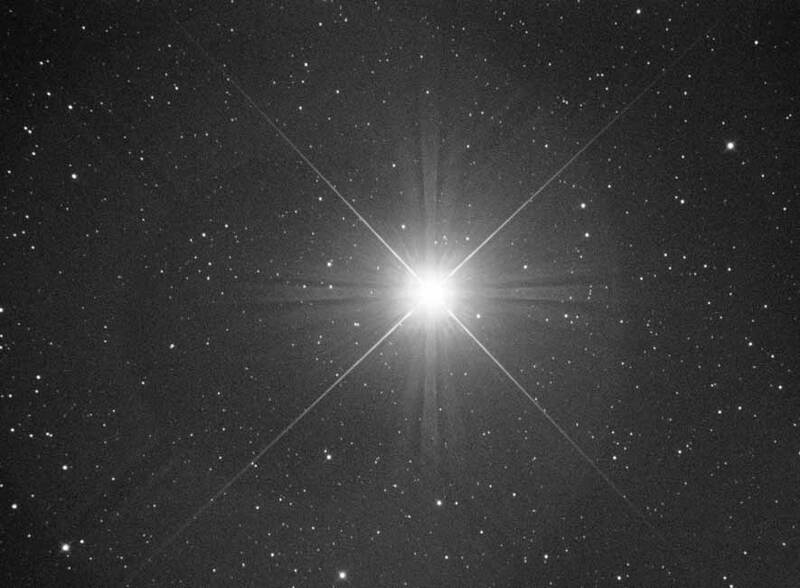 It may be that some people who have not had the problem yet are just not imaging bright enough stars. It may also be that the pattern is there but very faint. @Mark, I forgot that I actually acquired frame sequences in multiple filters a while back. I'll process and share those when I get home, on the original thread I started on this issue. Hopefully you can confirm (or refute) whether it is indeed microlens diffraction or not. Based in my experience imaging Pleiades, the pattern is indeed different in each color channel...however with broadband filters it is tougher to identify the microlens reflections. Hopefully I have both Ha and OIII data at home that I'll be able to share. Edited by Jon Rista, 01 February 2017 - 01:53 PM. 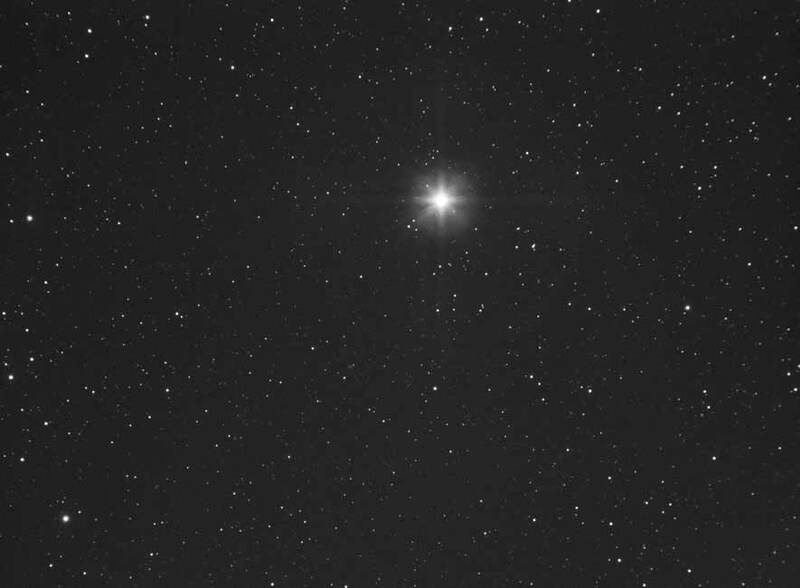 I was advised that it could be infra red, so using my RC6 i shot a bright star with a UV/IR luminance filter (which is what the second attachment is. Slight difference in shape of reflection but its still there. Hope this is of some use - exposure i believe was 60s in both attachments, single uncalibrated then converted to small jpeg to post on here. I was thinking of trying the QHY9 but it seems they also have the microlens problem? I liked the 163m all except for the amp glow and reflections, and if the QHY9 has amp glow and reflections 'plus' is a noisier sensor, then the qhy9 is unlikely a better option esp considering its higher price. Microlens diffraction issues are not uncommon. I know that the ubiquitous KAF-8300 has demonstrated the issue as well. Not everyone experiences it even with the KAF...I don't know why. I don't think that many manufacturers are putting multicoated sensor cover glass in their cameras, but that might be a solution. I'll mention the issue to Sam. The ZWO guys seem to like solving little problems, and it is very likely they would find a solution if they knew about the issue and took some time to investigate it. The sensors come from the manufacturer with the cover glass installed. Removing it is a destructive process, so I seriously doubt that any camera manufacturer changes the cover glass. I suppose that the camera manufacturer may be able to order the sensors with AR glass and that may account for the difference, though that seems unlikely. The sensor manufacturers are unlikely, IMO, to change their manufacturing process for a very, very small market. I wasn't suggesting they would change existing cameras, although I don't see any reason they couldn't swap out the sensor assembly with a different one. I figure if ZWO fixes it, they will release a v4 version of the camera. They already refined the original with v2 updates (integrated USB hub instead of guider port, revamped desiccant tablet holder in the sensor compartment) and v3 updates (revamped body/heatsink design to heat AR window with TEC energy, further improved desiccant management with external tablet holder). ZWO seems very willing to improve their camera designs over time based on user feedback and their own testing or in response to competition. Edited by Jon Rista, 01 February 2017 - 07:00 PM. I'm not sure about that. Sam has discussed the bonding used to glue the glass to the sensor. I encountered an issue with the glue on the ASI071 when deep cooling, and Sam indicated they would address the problem. That indicates they have control over the bonding, which implies they added the cover glass. I'm not convinced that the sensors come with the cover glass. Why would they? This sensor is also a mirrorless camera sensor, in cameras which use a low pass and IR cutoff filter stack over the sensor, rather than just clear optical glass. Doesn't make sense that the sensors would be sold by the manufacturer with the cover glass in place. It would greatly limit the options and applicability, not to mention the fact that I've never seen cover glass mentioned in any sensor datasheet that I've ever read. Edited by Jon Rista, 02 February 2017 - 04:12 AM. I've seen an image of the Jellyfish on astrobin taken with Star71 and ASI1600MM in Ha and Oiii. It might give us what we need because the artifact is quite obvious. I'll take a closer look tonight. I placed this question on QHY forum, let's see if someone can clarify (A.R. coatings on the sensor's coverglass or not). Yes, sensors should be delivered fully sealed and with cover glass in place, even a low amount of humidity can damage the sensor over time, so shiping them "open" is a no go. Then sensor manufacturers MUST be able to supply sensors with different kids of cover glass. Not every camera is able to use simple clear cover glass. In the case of CCD cameras, maybe it is always clear, however with photography CMOS sensors, they need low pass and IR cutoff filters instead of cover glass, and the thickness of them depends on the registration distance of the camera. And looking at the KAF-8300 data sheet there, there is an option to get an AR coated cover glass as well as a non coated one. DSLR cameras have these filters (commonly known as LPF#1 and LPF#2) in addition to the sensor cover glass. I saw that too. Maybe that is why some people see the artifacts and others don't. It is possible that some camera manufacturers order the AR glass and others don't, though I can't understand why any manufacturer would want non-AR cover glass. Of course, e have no idea of the Panasonic sensor is available with AR cover glass or not, though it stands to reason that it would be. If so, it would be an easy fix for future generations of the ASI1600. As Mark pointed out, all of the "custom" filtering such as UV/IR, anti-aliasing, etc. for consumer cameras is done with additional filter packs. 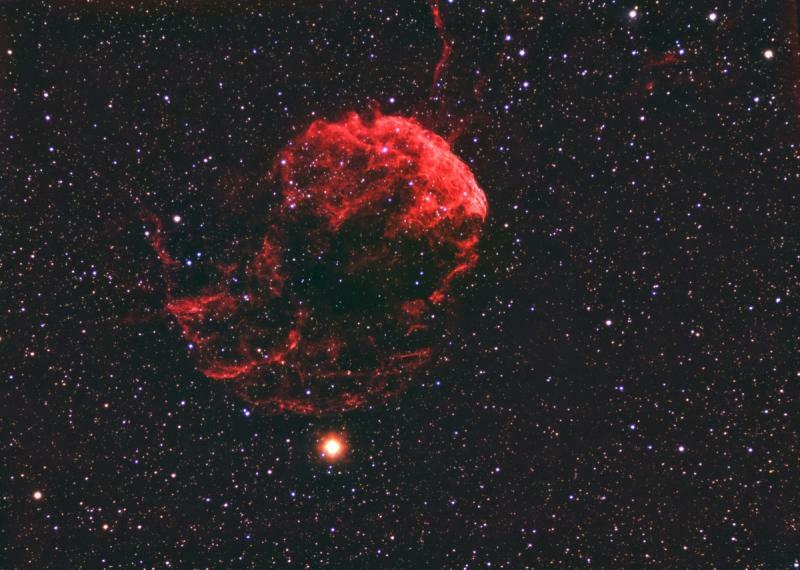 It's taken with the WO Star71, ASI1600MM and 3 narrowband filters. The artefact is very obvious in R and G (which I assume to be SII and Ha) but frustratingly it doesn't appear in the OIII channel (which I assume is the Blue channel). So unfortunately it provides no information about whether the artefact is a diffraction pattern or not. Edited by sharkmelley, 02 February 2017 - 02:27 PM. I know that with Canon cameras, this is not the case. Particularly with newer cameras, the LPF2 filter is actually bonded directly to the sensor. The IR cut may be sandwitched between LPF2 and LPF1, or integrated directly into them. Of course...Canon manufactures their own sensors, so maybe they are a little different. Does it mean there's a list of Canon cameras that modifiers refuse to touch? Edited by sharkmelley, 03 February 2017 - 02:22 AM. Well, I think it depends on the mod. You can remove the LPF1/IRCut filter, and leave the LPF2. I know that some video fanatics have gone so far as to heat the sensor with a heat gun just enough to soften the glue, and work it off. I honestly don't know how well that has ever gone, as I imagine there would be remnants of glue left behind. I do know that my 5D III has the LPF2 bonded to the sensor, so it really cannot be removed without extreme, likely damaging measures. I was pretty sure that Sony sensors were similar, that they only had an LPF1 and LPD2, and that the IRcut was integrated into one of them. That may just be one Sony camera, though. Anyway. There has to be some level of flexibility on main stream CMOS sensors. I'll query Sam and see if there is any option for them to get sensors with AR coated glass for future cameras. Well this thread really adds info to my problem also...I have the ZWO178 c non cooled....and with my new stellavue 70 triplet I am getting the same problems...With my doublet the stars were more bloated than anything but with the triplet I am getting the halo with a "black" circle in the center the stars. I was thinking the new OTA was the problem so I shot 2 nights with my Nikon and did not have the problem.So it has to be the ZWO that is causing the problem. I removed all filters and still get the problem. 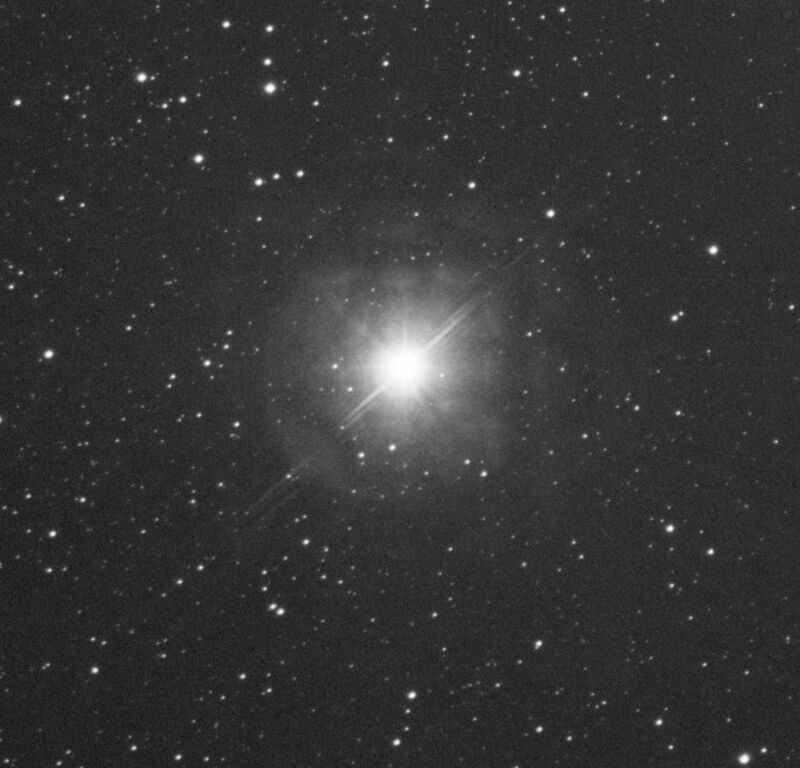 I have been using the star spike program to add spikes to the image to help hide the problem. So I guess the only fix would be to contact ZWO and see about what they have to say about it..Right? Maybe the cover glass does actually have an AR coating that works quite well at most wavelengths but is not optimised for H-alpha. Hence maybe it is possible that only H-alpha (and Sii which is a nearby wavelength) produces a strong artefact. Certainly it's pure conjecture. I don't know enough about AR coatings to know their range of effectiveness. It's possible. If the coating is a single layer coating, it wouldn't be very effective. A multicoating uses multiple layers of coating, each with a different thickness. The thickness of the layer (or combined layers) has to be half the wavelength of the light it is intended to affect. A multicoating works by using the wave nature of light and the interference of waves 180 degrees out of phase to cancel out reflections. (Note, they do not really prevent reflections, they simply cancel them.) Light reflected off the primary surface will then interfere with light reflected off the coating. With a multicoating, there are multiple layers which create many secondary surfaces, and thus allow for a range of wavelengths to be canceled by interference. Thing about a multicoating is, they are not perfect. They can perfectly cancel wavelengths that exactly match all the wavelengths at the various thicknesses of the combined layers, from the first layer to N layers (for however many layers there are). Wavelengths that fall between these exact matches would only experience partial negation, as the phase of the counteracting reflections wouldn't be exactly 180 degrees. Now, if the wavelength of the Ha band fell right between the thickness of two layers, then it would not get full correction. At the moment, I am thinking the cover glass simply does not have any coatings, since I have combined LRGB images that exhibit different reflection patterns for different bands. As a side note...the ability to cancel reflections depends on there being additional reflecting photons at the same time that can cancel the original photons reflected. Maybe with low flux, that becomes more difficult? Edited by Jon Rista, 03 February 2017 - 08:00 PM. if such filters exist that is? I did the same image last night and same type of pattern. I ended up flipping all my filters as that was Baader told me to do as the relfection from the field flatner may be causing it also. Net times its clear I'll try with the filters reversed. My understanding (I may be wrong) is that a stream of single photons fired at a double slit can create diffraction patterns even though it is an interference process. If so then I'm guessing the same is true of the interference process used by AR layers. Indeed. The single photon diffraction with a double slit is one of the reasons why I believe there is more to diffraction than simply the interference of propagating wavefronts. The Huygens principle is certainly a neat one, but it doesn't really fully explain how diffraction can occur without actual interference. I actually came across a theory (I'm a sucker for alternative physics theories and models, as I find there are too many holes and half-explanations and ignorance of falsifications with mainstream quantum physics, and that alway bugs me ) from a guy a few years ago...guy named...La Point? He proposed a model purely dependent on the electromagnetic force (no need for any other force, effectively a unified field theory) where all subatomic particles have bowl-shaped electromagnetic poles with continuous fields that falloff inverse square. That guy is the only guy I know who seemed to adequately explain single photon diffraction (among other things, he even neatly and very simplistically explained why and how particles quantize & self-organize into atoms and why the positive particles don't repel each other and fly apart). Actually, his model explained pretty much everything curious and quirky we observe with both particle physics as well as superstructures in space.